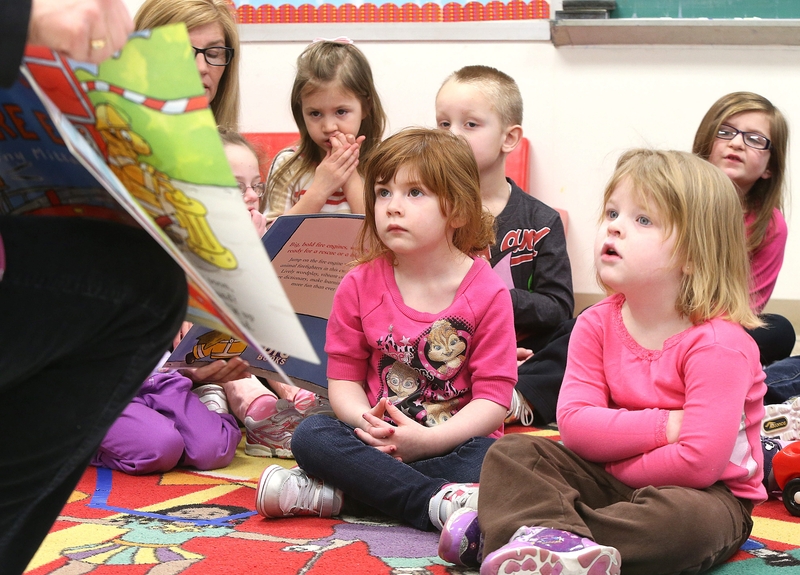 Prekindergarten students at Olmsted Center for Sight listen as a book is read Tuesday at the announcement of the Books for Kids kickoff. Since 1995, more than 2.2 million books have been distributed in Western New York through the efforts of Books for Kids, which kicked off its annual book drive Tuesday at the Olmsted Center for Sight’s Early Education Program in Amherst. The Books for Kids initiative is sponsored by The Buffalo News in partnership with Project Flight, the Buffalo & Erie County Public Library, Wegmans and WGRZ-Channel 2. It was started in 1995 by former Buffalo News reporter Rose Ciotta with the help of Buffalo State College professors Geraldine E. Bard and Betty J. Cappella, co-founders of the literacy organization Project Flight. In the past two months alone, more than 10,000 books have been distributed, said Mary Jean Jakubowski, director of the library. This year’s drive runs from March 1 to 31. Books for Kids also hopes to raise $15,000 in cash donations to purchase books for children with special needs, including bilingual, braille and specialty books. The Olmsted Center for Sight serves children who are either blind, visually impaired or have some other kind of disability, said Teresa Doermer, education director. The center’s pupils have received books through the drive for the past 15 years. A storytelling circle involving about a dozen of the school’s prekindergartners demonstrated the power of books as children ages 3 to 5 listened to a teacher reading “Flashing Fire Engines” by Tony Mitton and Ant Parker. “We make sure every single child gets a book and also one to take home as a holiday gift,” Doermer said. The Central Library serves as a distribution hub for the project, said Melissa Blattner, manager of Project Flight BookBank. Blattner, who catalogs the massive inventory, cited a special need for multicultural and manipulative books. “Those are the type of books children need to touch and feel to get the full advantage,” she said. In 2013, Books for Kids distributed 90,608 books to individual children, schools and organizations. The children receiving these books may be in homes where books are not a priority, Jakubowski said. Additional drop-off points include all Wegmans and Barnes & Noble locations; Tom’s Restaurant, 3221 Sheridan Drive in Amherst; and the lobby of The News, corner of Scott and Washington streets. Checks can be made payable to Books for Kids/Project Flight. Contributions may be mailed to Books for Kids c/o The Buffalo News, One News Plaza, PO Box 100, Buffalo, NY 14240, or they can be made online at www.buffalonews.com/booksforkids.